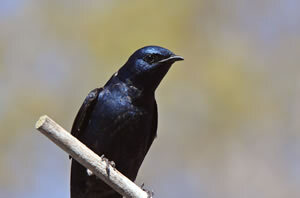 Featured Favorite Bird - Purple Martin, Learn all about Purple Martins. ■ The largest of the North American swallows. In eastern North America it has nested almost exclusively in nest boxes for more than 100 years. ■ Distinguished from other swallows by large size and stocky shape. No other swallow has a dark belly. ■ The Purple Martin not only gets all its food in flight, it gets all its water that way too. It skims the surface of a pond and scoops up the water with its lower bill. ■ The Purple Martin clutch size is 1-8 eggs. Egg color is white. Incubation period is 15-18 days. Chicks fledge in 28-29 days.